I have tried to find pf70 silver proof yuan Ming yuan with good price but fail. Price too high and many of my collectors mate in Singapore have given up to own it. Thanks andrewlee10 for the insight. How much is the PF70 YMY being offered to you?! Thanks. here you go. I can assure you this isn't a lighting issue. Hopefully these shots, clearly and demontrably show the white haze on the medal. I will send it in to NCS to see if they can remove, but I'm not hopeful. But again, I must clearly state, and emphatically point out, the artistic quality of this medal is stunning. Oh, and trust me, I know the person and his family, and they felt bad they didn't check before sending. They encouraged me to send it back, but I refused. He was kind enough to offer a credit, even though I didn't ask. This dealer is a class act, and one of my favorites. Slab or Omp it is very personal.... Someone like Omp and Another like slab. Some with view high grade as good quality and bad grade as bad quality. There is no right or wrong as my view. Simple logic, you like it but it and do not like it leave it. I will buy pf69 or pf70 if the price is reasonable and acceptable at my range. For those who has no contact in china only able to get it from eBay. There are only 2 sellers in eBay dragon Zheng and tintcat. Did you say you will conserve your medal? I have been wondering if to have a "preventative" conservation done for mine before slabbing because they got to me not in the double OMP. I am concerned that pollutants may cause longterm damage if the medal is already contaminated. But conservation is also not an innocous process. I can conserve yours by myself for free while I send mine to NCS!!!! BTW if you ever come across a "shoddy" 1985 China 1Yuan Brass Panda coin please toss it my way!!! Are these (red arrows) contact marks (such as the edge of one coin hitting this coin)? If so, it is unlikely you would receive a grade better than PF68, likely lower. I think you should return it, if so. Conservation with NCS is moot in such case. Can you please provide further elucidation on your thought above. I'm an unschooled, oridnary, poor country person, and I don't follow your point. Thanks KOT. If I had a shoddy 1985 brass, I'd certainly consider selling for a price. Sure thing. I'm not sure how they got there Sandac, it came this way in the capsule, unfortunately. They are indeed dots on the medal. I'll heed your words of wisdom, and just 'chuck' it back in the treasure box. Maybe I'll melt it one day and make a silver ring with it. lol. Thanks again for the wise words of counsel. This is a good point that brings perspective to my initial sour grapes knee jerk. 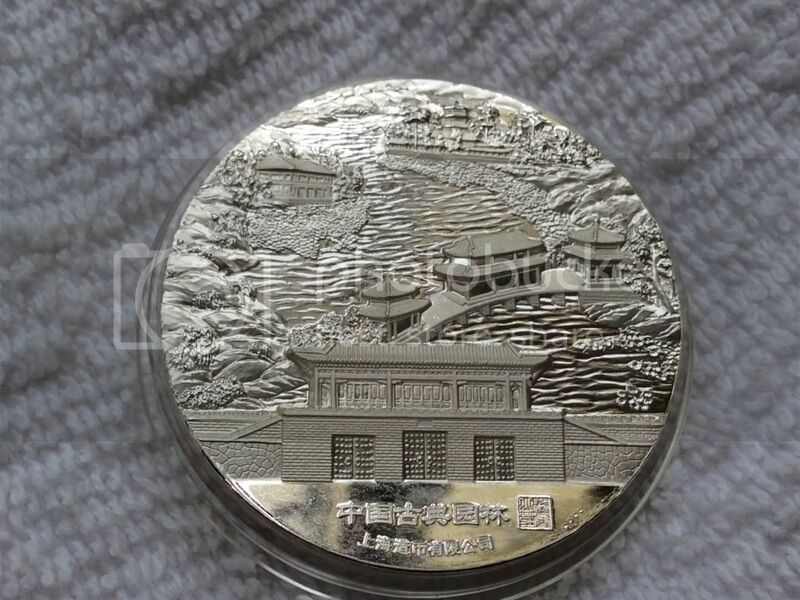 The 2014 Old Summer Palace (YuanMingYuan) has a Silver Proof Mintage: 1000 with Total Graded at NGC: 272 (a little over 1/4th of population) 68 - 95, 69 - 158, 70 - 6. YuanMingYuan was special because of the extra high relief so low quantities graded at 70 can be easily rationalized along with high pricing and general unavailability. The 2014 Summer Palace Corridor Silver Proof mintage & total graded are about the same as YuanMingYuan but graded better with 68 - 4, 69 - 174, 70 - 96. The Summer Palace Gate's stats are not yet public but the Modern China Mina Quality Trap may have gotten me. I do not think this concept is valid when applied to the artistic efforts in minting we see with some of the later issues of this series. FWIW I have not had time to study the Summer Palace Gate but I will be interested in counting how many different surface texture facets it has. Yuan Ming Yuan 3-coin, 2 oz. silver, 2 oz. antique silver and brass medal set at initial price of RMB 3,500, then lower to RMB 2,800 (US$470). Nobody takes. Sorry! Meant to be a joke, following yours. Previous posts showed I don't know how to conserve coins. Yet I offered to conserve yours while sending mine to NCS! I used your word "shoddy" to characterize a very rare coin that has been sold for more than $30,000. Even a "shoddy one" sold $10,000! So if you give me a shoddy one for free, you'll go to heaven! A shoddy mountain resort medal is still something to cherish! Lol!! So the release price for the three medals is 1800RMB (USD290 today's exchange rate) and sale price in one instance is 3000RMB (USD483 today's exchange rate) (USD490 your figure). Quite a differential from what we have here on eBay on initial review. I have lamented in the past our inability to easily access the Chinese market directly or get these direct from the mints. So we have to buy double/triple resold from eBay. The offer price for the same set from a reseller on eBay is currently $658. ?A good deal taking into consideration eBay hosting fees, PayPal charge, international post and package cost, and profit spread? The jury is still out? That really is amazing KOT. 30K? wow. 10K for a decent/shoddy one, even a greater wow. Yeah, I'm not a buyer of that thing even at 10k, even for a shoddy one. lol. Yeah, I wish I could conserve my owon coins/medals too, and apparently a china dealer has a way to conserve and guarantee for a life-time??? I believe it when I see it. Until then, I send mine (early year medals and coins, or if they look as 'bad' as the shoddy mountain resort) in to NCS. However, after what SADAC said, I won't be sending it in...but I have 30 medals and coins coming back from NCS...can't wait to see these beauties, conserved and graded. yippeeee. P.S. If anyone wants to buy my shoddy Mountain PF piece, I'd be happy to give it to you for the low price of 149.00, shipping included.